Brno City Theatre has come out with another premiere of a Czech musical in the form of Big. This musical novelty, taken from the film of the same name, will entertain children, adolescents and their parents. This musical tale is truly for all the generations. Big is a family comedy, in places also a fantasy spectacle, in others a romantic sweet piece about love or an exciting story of an impatient little boy, in which however all ends well. This is how it is if a child wants to grow up at once… This story of a child, not yet thirteen, who has his wish to be an adult granted by a fairground machine, was a hit movie with Tom Hanks at the end of the eighties. Little John Baskin wakes up in the body of a thirty-year-old man. But there is one little catch. The young man remains in spirit a child, which in the complicated adult world represents for the main hero more than a few problems, not only in his love life but also in terms of the social and working worlds. The musical adaptation of the famous film from 1988 had its premiere on Broadway in 1996 and was nominated straight off for five Tony Awards (in the end they mostly won by the musical Rent, which will be premiered by the Brno City theatre in a few days’ time). How did the production turn out under the direction of Petr Gazdík? The production team tried in this musical to underline the playful dimension of this musical comedy; alongside its humour the audience is also to feel the magic of the sets and lights, as well as the energy of the dance numbers from the adult and also the children’s companies. And paradoxically despite a certain sparseness of events, the musical sweetness of the tale and many seemingly deep song lyrics on the whole they have managed it. The renowned musical creators David Shire (music) and Richard Maltby Jr. (lyrics) in cooperation with the screenwriter John Weidman modified the film script, which faithfully copies the original. And in a similar way it set off for Brno: the magical slot machine with the secret Zoltar is pretty much the same as the original one from the screen. These are not important facts – more important is that Gazdík prepared a briskly flowing piece, which entertains not only with the famous scene from the toyshop, in which the protagonist hops out the melody of the popular song Heart and Soul on a giant keyboard. The production of Big won me over, despite some significant misgivings in places over the quality of the text (director Petr Gazdík worked with Karel Škarka on the Czech translation), with the truly energetic choreography of Carli Rebecca Jefferson, the sets by Emil Konečný and the musical production by Dan Kalousek and Jakub Žídek here played by a thirty-five piece orchestra with an excellent sound. In the crowd scenes Gazdík worked with a large group of almost thirty children and their expressive movement is infectious. The adults also dance and on stage alongside rap there are some interesting creations dominated by step, jazz, modern or for example street dance. The choreography here is full of emotion and energy and gives this fairy-tale musical its necessary earthly juice. The final scene uses only big things, like bridge arches, interestingly lit. These arched wings are the perfect backdrop fora story of New York and at the same time a fantastic tale. I have reservations about the grey costumes by Eliška Ondráčková Lupačová, since a tale for children would be better suited by stronger or unrestrained colourfulness. As is usually the case in the Brno City Theatre Brno, thanks to its busy schedule, here the main roles are also alternated. This comes of course from necessity (before the premiere one of the actors playing the main role of Susan broke her leg and so the second actor for that role actually saved the premiere and further performances of the musical). 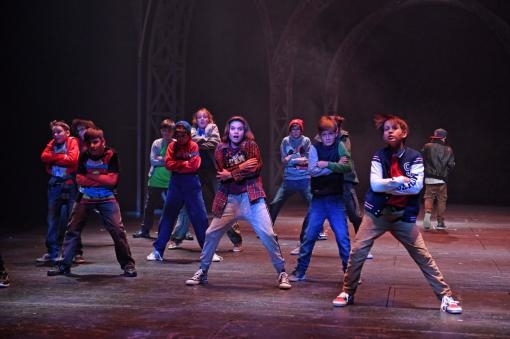 The main children’s role is taken by turn by the director’s ten-year-old sons Adam and Josef Gazdík, who can be in places criticised for their singing, but these shortcomings are overcome by the confidence of their presence and speech on stage. The main role of the big John Baskin is a welcome opportunity to fully utilise the acting, dancing and singing talents of Brožek, who contributes far more than just his youthful appearance. Viktória Matušovová was also exactly right in her singing and acting in the role of Susan, who is desperately in love with this overgrown child and at the end must find a way to escape from this sweet feeling. The production team promised a magical tale about the fulfilling of wishes for young and old, which enchants with wonderful music, fantastic dance numbers and kindly humour. Putting on such a family musical in the run-up to Christmas is a sure thing, and not just in terms of the theatre’s revenues. It needs to be said that the three-hundred-times performed and now-ended Mary Poppins now has a worthy successor, which fortunately is not so immaturely overdone in its production as Děsnej pátek (Awful Friday), which is also aimed at the whole family.